Course Description: In conjunction with the United Nations International Day of Peace on Sept. 21. 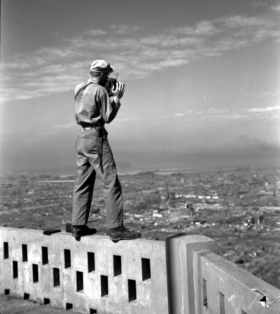 Joe O'Donnell was a 23-year-old photojournalist for the U.S. Navy when he arrived in Japan in 1945. His photos from on the ground in the atomic wastelands of Nagasaki can be used to spark classroom discussions on war and peace. Join Ron Eisenman (Rutland, VT HS), John Frank (retired IN social studies teacher) and Anne Prescott as they introduce new curriculum materials for teaching about immediate post-war Japan using O'Donnell's photos.